I don't know about you, but I usually make or put together my Halloween costume. It's a bunch of fun and I don't spend too much cash - which I obviously save for travel. This year I'll be heading out on a BIG adventure to Antarctica the day after Halloween so this year the costume is gonna be super easy and definitely DIY. Here are a few travel inspired Halloween costume ideas I came up with! Who didn't love Where's Waldo as a kid? I know I did and I've been Waldo for Halloween before - sorry I couldn't find a picture. It's fun and super easy. Striped shirt, hat, glasses, jeans, and a cane. You can also add binoculars, a backpack, camera, tea pot, etc. He has a ton of stuff! What's great about this costume is the photo ops. You can hide behind people and things throughout the night. Remember to photo bomb as many photos as humanly possible! If you end up going all out with the stuff you carry, randomly leave it all over the place. Come on vaminos, everybody lets go! I was a little too old for Dora the Explorer when it came out, but that doesn't mean she isn't a pretty awesome adventurer. Grab a pink shirt, orange shorts, purple backpack, and a stuffed monkey and you're good to go! Learn a few of Dora's catch phrases and drop them into conservation throughout the night, talk to your monkey, and explore the area your in and you'll be the full Dora the Explorer package. Who else watched this show as a kid? I was OBSESSED! 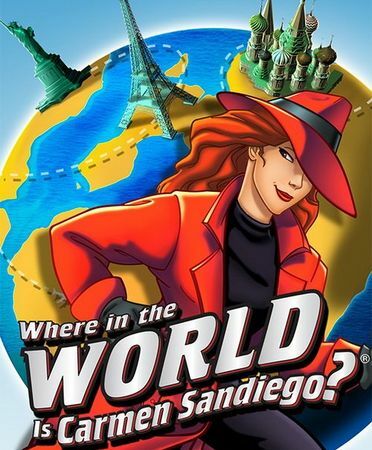 I've been toying with the idea of being Carmen Sandiego for years now and have always had a hard time finding the right gear. Maybe this is the year! Almost everyone has a black pair of pants and a black shirt in their wardrobe, so I'm going to skip right over that. It's the hat and the red trench coat that are the main focus of the costume. The band on the hat changes from black to yellow depending on what graphics you see, so make your own choice there. Oh the tacky tourist! You've seen them, you've judged them, now rock this costume like nobody's business. Many of these items you might have laying around the house. Everyone can do some sort of socks and sandals get up. Grab a pair of khaki pants, preferably ones that are way too big. The key to this whole outfit is a Hawaiian shirt, make it big and bright, the more ridiculous the better! Any sized camera is good. I wouldn't use anything super nice in case you have too good of a time at the party. During the party take pictures of EVERYTHING, apply lots of sunscreen, talk really loud, ya know, do all the things you find really annoying about tourists. This little guy is becoming a classic travel icon and a really easy costume! You only need 4 things for this entire costume. The beard is a must! I tried finding one on Amazon that matches his, but but couldn't find anything that wasn't really expensive. Maybe you'll have some luck at your local store. The red gnome hat and the blue jacket are essential and add a black belt that you'll probably find somewhere at home! While in costume plant yourself in random places. 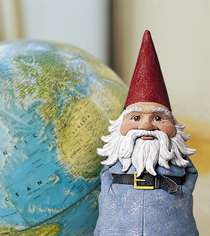 Just stand there in the Roaming Gnome pose and when no one is looking move and do the same thing over and over again. It'll be hilarious! Cue the Indy theme song! One of my favorite adventure movies of all time. If you do this costume and someone doesn't know who you are, you probably shouldn't be friends with them...cause they're lame. Just kidding, but not really. Grab some brown pants from home and add the khaki shirt. No Indiana Jones costume would be complete without his trusty whip and satchel. And don't forget the hat, Indy doesn't got anywhere without his hat. When you're in costume, leave your hat around the room and occasionally grab it in a very dramatic fashion. To get really into it bring a rubber snake or 3 and say, "Snakes! Why did it have to be snakes?" Indy says so many funny one liners in the movies, so to prepare for the costume you should probably re-watch all the movies. Cause why not? Paddington is the cutest little traveler out there. This Peruvian bear is found in in the Paddington Railway station with a note on him saying, "Please look after this bear. Thank you." When Paddington is found he's wearing his floppy red hat. In the book it says the hat is worn, so if you buy one try to make it look well used. The Brown Family that finds Paddington gives him red rain boots and a blue coat. And don't forget the note pinned to your coat. At a party or while out trick-or-treating sit down and pretend you're lost. While cute for Paddington that probably isn't the best idea, scrap that. He is a very polite bear and always addresses everyone by Mr. and Mrs., make sure you do that. This costume can be as complicated or as simple as you want. Either way it'll be really fun. The easy way to be a map would be to buy this adorable map dress! If you want to dive into a fun project make a paper mache globe big enough for you to fit inside equipped with holes for arms, head, and legs.